1 of 4 Heat grill to medium-high. Bring a large pot of lightly salted water to boiling. Split tenderloins lengthwise almost all the way through and flatten like a book. 2 of 4 Place in a glass dish and add 1/4 cup of the Caesar dressing, turning to coat. 3 of 4 Cook pasta in boiling water for 7 minutes or as per package directions. Drain and rinse. Meanwhile, grill pork, covered, for 4 minutes per side, turning once. Transfer to a cutting board and let rest 5 minutes. 4 of 4 Combine pasta, chickpeas, artichoke hearts, tomatoes, cucumber and, if desired, olives. Blend remaining 1/4 cup dressing and the mayonnaise. Toss with pasta mixture. 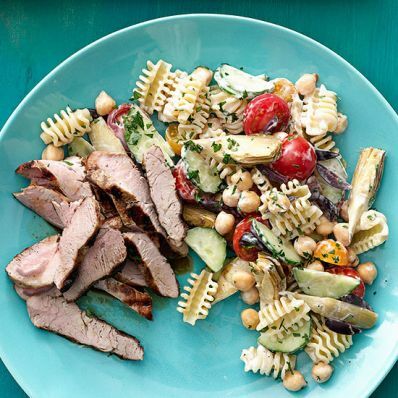 Slice pork; serve with pasta salad.